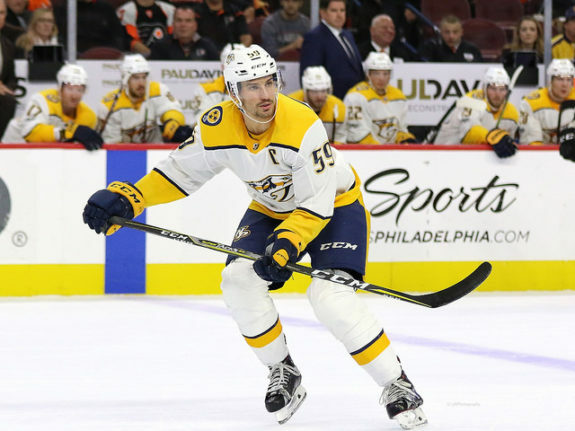 The Nashville Predators’ season fell short by a few rounds as the Winnipeg Jets vanquished them in seven games. There were many reasons why the chips fell as they did, but I wanted to highlight a few of them. A lot of these reasons were present through the season but were covered by the immaculate goaltending of Pekka Rinne. The defense has always been bad in their own zone and the forwards have always had an issue getting to the front of the net. Regular season success doesn’t always translate to the playoffs. Coaches have more time to game plan for one strategy and home-ice advantage means creating line mismatches that can change a game. While the forwards and defense were shut down by the Jets, Peter Laviolette and company did little to change their gameplan. So without giving away my final point, let’s start with the forward issues. All stats you see below are at even strength unless explicitly stated otherwise. At least the first line showed up, eh? Ryan Johansen and Filip Forsberg especially were willing the Predators to victory in the first few games. 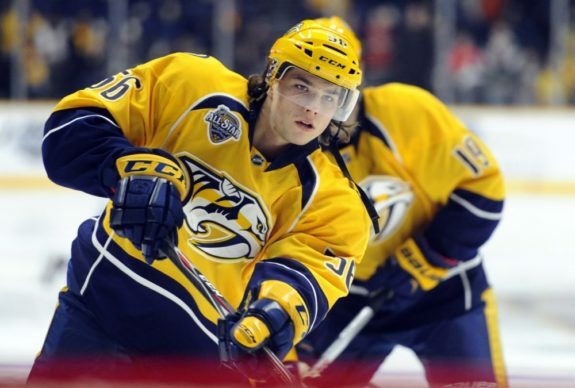 Not to be outdone, Viktor Arvidsson finished off the series in spectacular fashion as he seemingly was the only Predator who could penetrate the high danger area in front of Connor Hellebuyck. If anyone thinks that they didn’t step up in a big enough way, I have no words for you. Otherwise, the offense was a ghost town. The third line was completely neutralized after an incredible first round, but that was mostly powered by Austin Watson who was clearly playing hurt. Things weren’t the same with Watson’s injury as the line struggled with below 44% Fenwicks and 42% high danger chance shares. The Jets constantly looked to throw out their top six against the trio and often made them look silly. 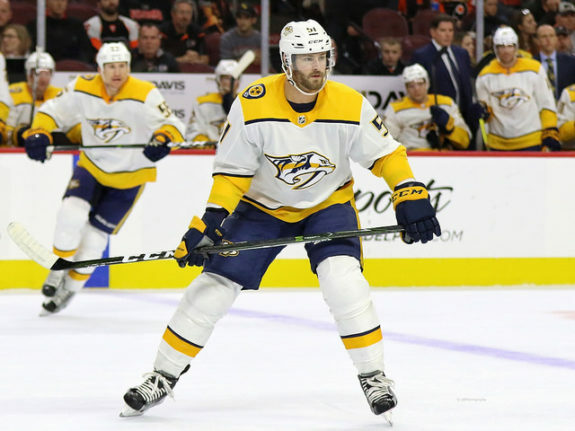 Even when the Predators had last change and could control matchups, Laviolette refused to shelter them and paid the price as the trio gave up four goals and produced none of their own except for a lone Watson shot. The fourth line wasn’t much better as Mike Fisher attempted to not be a liability. In his defense, he was playing with the injured husk of Calle Jarnkrok and a rotating door of Ryan Hartman, Scott Hartnell, and Miikka Salomaki. Hartman was also injured during this time while Hartnell was a flight risk due to his lack of speed. Salomaki is also apparently just plain bad, which didn’t leave Laviolette with many options. Except that he had the whole Milwaukee Admirals to call upon. More specifically, Frederick Gaudreau and new offensive toy Emil Pettersson. Despite that, the fourth line was a walking band-aid and a liability in all three zones. Then there’s the second line… I really didn’t expect Kevin Fiala to stop producing, even though he was second on the team with 10 high danger chances created. Kyle Turris is another story though, as most of his production usually comes on the power play. He was dynamite during the regular season and I thought he might’ve turned a corner now that he had some great linemates, but he seemed to regress. Otherwise, I thought Craig Smith was fine, nothing more and nothing less. The trio dominated possession and high danger chances, but at the end of the day they ended with an even goal differential and that’s what matters. They were also heavily sheltered in terms of talent and zone starts. Let’s start with a little context. After the epic collapse in Game 3, the Predators reverted back to a style called the trap. It’s designed to clog the neutral zone and force the opposing team to surrender possession by dumping the puck in and chasing after it. It’s terrible to watch, but it does win games if the trap-utilizing team scores first. That said, the Predators were absolutely terrible in their own zone. If they couldn’t stop the Jets in the neutral zone, the Predators rarely stopped them at all. Roman Josi and Ryan Ellis may as well have been ghosts in the second round. They lacked any sort of physical presence in the corners as well as in front of the net. 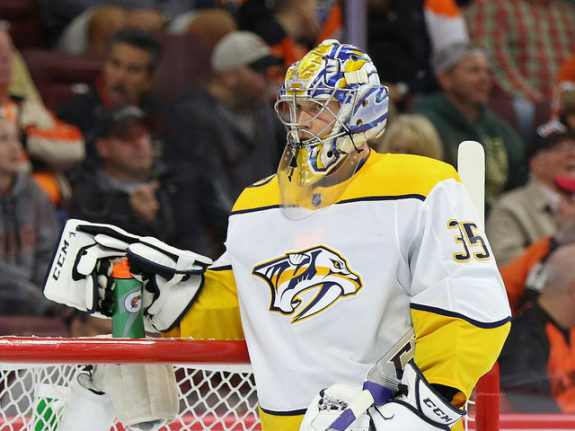 Rinne had to bail them out two or three times a night, but when he couldn’t, the Jets usually scored or missed the net. The duo had an average Corsi but a 48.37% Fenwick, the real horror show is the goal differential. Josi and Ellis were on the ice for four goals in their favor while giving up nine goals at even strength. This isn’t exactly surprising though as they surrendered 35 high danger chances in seven games. The Jets saw a weak spot on the first pair and did everything they could to exploit it. The second pair wasn’t as susceptible though, as P.K. Subban and Mattias Ekholm performed admirably. They were a positive in every way shape and form, except for goal differential, but that’s because of their opponent’s skill. The duo only saw the Scheifele or Laine line and stifled them as best they could. Subban and Ekholm did give up some late goals, but it’s not exactly fair to blame them. Peter Laviolette couldn’t trust his first or third pairing, and so had to play an already exhausted second pair. The fact is that while Subban and Ekholm were far from perfect, they did much better in their roles than any other defensemen could’ve done. I don’t have much to critique here, but Subban did take an excessive amount of penalties, so there’s always that. Third pairings can be tricky. Coaches can artificially pump up their numbers by sheltering them in terms of talent and zone starts, or they can just not play much. 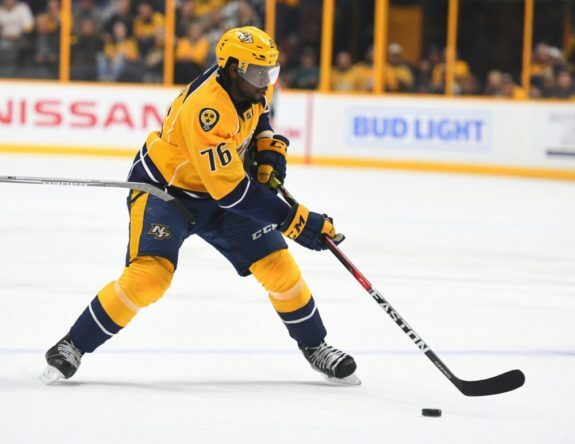 The Predators utilized two of the three techniques here as the third line rarely if ever saw top six talent while also averaging around 10 minutes per game at even strength. I think the third line all together (Weber, Emelin, Irwin) saw about 70 minutes in seven games. Peter Laviolette didn’t trust his third line in any situations, and it took a big toll on his top four as the series went on. I don’t really love Peter Laviolette as a head coach. I think he’s too slow to adapt and relies too heavily on outdated systems. While I think he didn’t make many good moves during the series, it wasn’t all bad. Here are some decisions of his that I agree with – continuing to shelter the Turris line despite them failing to score and pulling Rinne after two soft goals in Game 7. That’s really it, otherwise, I think that his poor decision making played a big part in the second round loss. The first coaching issue I wish to highlight is his failure to recognize his crumbling defensive zone structure. The Predators like to play their wings high so that they can make quick breakouts and catch their opposition flat-footed. Unfortunately, that didn’t work against the Jets as they dominated possession along the corners and often outnumbered the Predators in the high danger area. Defensemen like Dustin Byfuglien and Tyler Myers would creep in when the Jets established possession and provided too many sticks for the Predators to cover in the net-front area. This resulted in 76 high danger chances against in only seven games at even strength. Despite hemorrhaging in the defensive zone, nothing changed. Laviolette kept having his defense bang their heads against the wall while expecting a different result. When the Predators realized that they couldn’t stop the Jets in their defensive zone, they launched a new plan. Well, not really a new plan as it’s been done for years. The Predators dusted off the trap after having abandoned it last post-season. We mostly saw it after Game 3 when the Predators surrendered a three-goal lead, but it kind of worked in Game 4 and Game 6. The trap remained a staple through the last three games of the series, but it did end up costing the Predators. The Jets developed a new plan of attack by spacing out their forwards and playing a dump and chase style. While this often doesn’t work against the trap, the Jets’ blend of speed and size outmuscled the Predators and kept them locked in their zone for minutes at a time. Once the Jets actually applied their forecheck, the Predators were back to square one in terms of defense. The Jets were better, plain and simple. Players besides Laine and Scheifele stepped up on offense, Jacob Trouba and Josh Morrissey were a great shutdown pair, and Paul Maurice made some excellent style changes. The offseason poses some serious questions for the Predators, and none that can be answered easily. I don’t believe general manager David Poile will want to make big changes, though.